Minimum quantity for "Biorganica Mixed Vegetables in oil" is 1.00. Minimum quantity for "Foleys Frothing Fermentations Turmeric Sauerkraut 500g" is 1.00. Minimum quantity for "Gutsy Ferments Smoked Garlic Sauerkraut 450g" is 1.00. 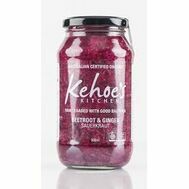 Minimum quantity for "Kehoe's Kitchen - Beetroot and Ginger Sauerkraut 500g" is 1.00. Minimum quantity for "Kehoe's Kitchen - Fennel and Garlic Sauerkraut 650g" is 1.00. Minimum quantity for "Kehoe's Kitchen - Spiced Carrot Sauerkraut 375ml" is 1.00. Minimum quantity for "Kehoe's Kitchen - Turmeric Sauerkraut 650g" is 1.00. Minimum quantity for "Red Dragon Lemon, Lime & Bitters 350ml" is 1.00. Minimum quantity for "Red Dragon Living Turmeric Elixir 350ml" is 1.00. Minimum quantity for "Remedy Kombucha Cherry Plum 330ml" is 1.00. A touch spicy. Delightfully luscious. Berry tempting. Minimum quantity for "Remedy Kombucha Ginger Berry 330ml" is 1.00. Minimum quantity for "Remedy Kombucha Ginger Lemon 330ml" is 1.00. Minimum quantity for "Remedy Kombucha Hibiscus Kiss 330ml" is 1.00. Minimum quantity for "Remedy Kombucha Lemon, Lime & Mint 330ml" is 1.00. Minimum quantity for "Remedy Kombucha Raspberry Lemonade 330ml" is 1.00.